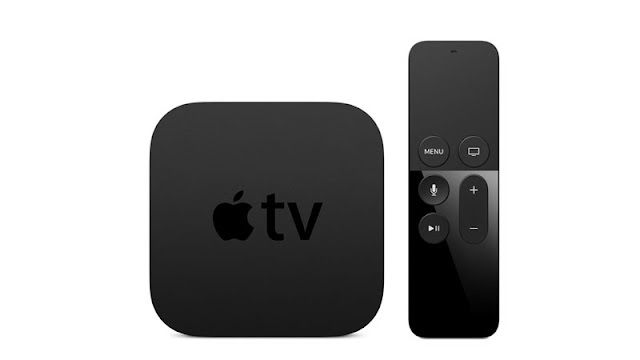 The new Apple TV will be available to order in the UK from 26 October (this was confirmed by Apple CEO Tim Cook at the WSJD Live Conference on 19 October), though the price is yet to be officially confirmed. According to Apple, the UK price of the new Apple TV will be confirmed when it goes on sale. What we know so far though is that the two US versions of Apple TV (32GB and 64GB) will cost $149 (£97) and $199 (£128) respectively. We can expect UK prices to be certainly much higher than US prices. My guess is that the new Apple TV will cost most likely double of the older Apple TV, which currently costs around £59. So, from Friday 26 October people will be able to order an Apple TV from the Apple website, an Apple high street store as well as other locations, like John Lewis but we won't be able to buy it from Amazon. The new Apple TV has a similar design to the current one but it's about 1cm (10mm) taller and around 3.3cm (1.3inches) thicker than the current Apple TV. The new Apple TV will also feature a USB-C port along with HDMI. This means the new Apple TV will no longer feature the optical audio out port found on the older Apple TV, though you will be able to listen to the audio via Bluetooth headphones. This feature is certainly exciting, especially if you live with flat mates and do not want to disturb your neighbors. The new Apple TV will feature a night mode which basically reduces the music soundtrack except the singing. The new Apple TV features Siri Remote, Voice and Touch control. According to Apple, they have redesigned the new Apple TV remote control with a glass touch surface across the top which will allow you to select a set of movies by simply gliding across and then stop on the movie you want. The Siri remote control comes standard with the new Apple TV and will allow the user to navigate the Apple TV and help the user find what they want to watch by simply holding down the "Siri" button and ask Siri what the user wants to watch. The user will also be able to ask Siri for info while they are watching TV. Apple TV will come with high def video screensavers and two versions, one with 32GB Flash storage and one with 64GB Flash storage. The new Apple TV will also come with a new operating system called tvOS software interface, which is based on iOS, but will not be compatible with the existing Apple TV. TVOS won’t run on the current or older models of Apple TV, though according to Apple there will be a compatibility update for recent Apple TVs. You will be able to use Apple-certified third party controllers and joy sticks with the new Apple TV. The Apple TV will actually support four different controller at once. Games coming to Apple TV include: Star Wars, Guitar Hero, Crossy Road and more. Crossy Road is already on the Amazon Fire TV but the Apple TV version will be multiplayer. There’s also Beats Sports with support for four players - all you need is an iPhone or iPad to join in.